As far as dolls go, the Lilli Dress-up Doll from HABA is one of the cutest. 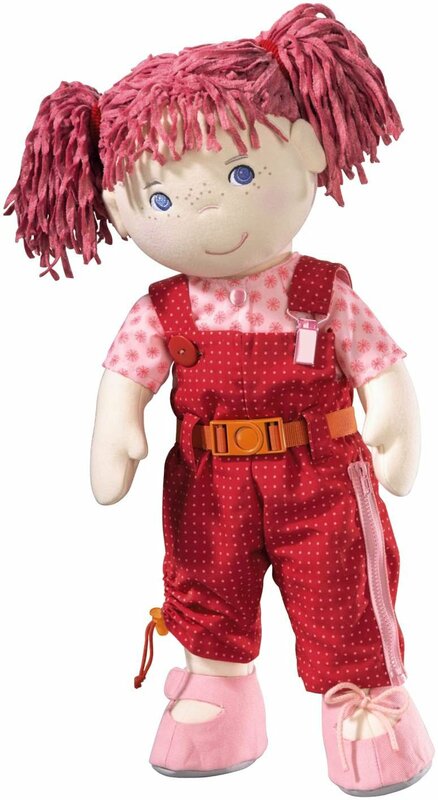 With her pink and red color scheme, this doll helps young children with the basics of tying, zipping, and snapping. Lilli wears an outfit of an overall jumper, undershirt and booties. On the outfit are zippers, buttons, clips, elastic drawstrings, and other pieces which will help your child get familiar with things such as how to tie a shoe or draw up an elastic string. A child can either play with the doll as normal or learn from it with interactive fine motor skills. My younger nieces enjoy playing with Lilli when they are around, and it gives me the opportunity to teach them some new things. She's so cute! My granddaughter and niece would love her.I like dolls that can be snuggled without worrying about eyes falling off.